The Tucson Homeskillet: Yes, We Finally Ate At Taco Giro. Yes, It Was Delicious. Yes, We Finally Ate At Taco Giro. Yes, It Was Delicious. Basically last week's post, the one about Pat's Drive In, should have been labeled as the "Barrio Hollywood Chronicles Part 1", because exploring all of the amazing food that area has to offer is on the top of our list. Not that we haven't been down there before, we have, many times, but not as frequently as we'd like. Why you may be asking yourself? The old Impala has been giving us nothing but problems and a few hazardous moments here and there for the past couple of years and after a while just driving it more than a mile proved to be a tense situation. It was totally worn out, a bit beat up and we ended spending more on the upkeep than what it was actually worth. One day the entire coolant system exploded, right around Xmas, and that set us back almost a grand. Happy holidays indeed. Another time, while simply running some errands, the car just stopped; died near an intersection. Turns out some major cable was worn so much that the connection was lost and it took a bunch of duct tape to hold it in place till we could get it into the shop. Fun huh? Yeah...no. The best was the reason we ended up buying a new whip and eventually, thankfully, ditching the old. The car...it just wouldn't start. It sounded like it wanted to start, it would be all "chug chug chug" but then...nothing. And when our trusted mechanic of many years is there, stunned, scratching his bald head in total confusion, staring blankly at the engine, we finally threw up our hands and went "That's it! We give up! We're getting a new car tomorrow." Now that a safe and efficient ride has been restored, our faith in our culinary adventures has been reinvigorated as well. So first up was a place we had been meaning to go to for quite some time. It's a local chain and is well known for its generous seafood platters among so many other fantastic bites. Taco Giro was always on the list as a "must try" but we never got around to it. But when we sampled their bean and bacon soup at last years Bacon Fest we knew we had to put it a bit closer to the top. It was delicious. Savory, salty, spicy and one of the few free nibbles to actually feature "bacon" and not its other namesake and cured companion, pork belly, which most other dishes did that day. It was also one of the few places that we went back to for seconds, and thirds, because of the texture and flavor of the soup was so delicious. So on a beautiful early autumn afternoon we got in the lovely new ride and headed down to St. Mary's to get our fill and to see if Taco Giro lives up to its reputation and reason for having five locations across Tucson. We chose the St. Mary's/Grande Ave location because we really wanted to get back to the Barrio Hollywood stretch. We love this part of town but because of unreliable wheels it has been elusive the last few years. Whatever, it was time to see (and eat) what Taco Giro had to offer up. First off, we were impressed that the parking lot was pretty full on a late afternoon Wednesday. It was pretty warm out, like high 80s, so only folks that could find shade on the inviting looking patio were out there. Once we got inside we were surprised to see that the actual space itself wasn't too slammed. In fact there were a bunch of tables available so we grabbed one and began scanning the rather wide breadth of the menu. "Where are all of those people then? 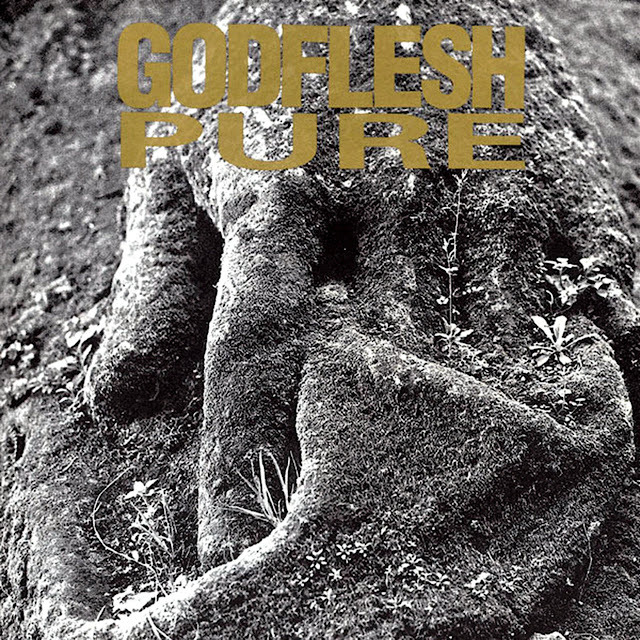 ", we asked ourselves. Perhaps there is a secret back room that can't be seen from the normal confines of the main dining area. A quick look around and we came up empty; no additional eating area. Huh. In fact we almost wound up in the kitchen looking for this phantom chamber. Sorry about that. A friendly server promptly arrived and got our drink order. She came back a minute or so later and asked if we were ready to order. We were not. For real, their menu isn't all Cheesecake Factory huge but it is seven pages of laminated items ranging from breakfast to dinner entrees. So, yeah, it took us a while. Eventually we decided to try some basic items and perhaps one or two "exotic" dishes. The soup that we fell in love with at the Bacon Festival was there, the carne es su jugo, but it was hot out and boasted a price of $12. Not that we're scared by elevated prices for quality items its just that, well...we kinda weren't in the mood. Next time Taco Giro...next time. We settled on a steak quesadilla (how can you go wrong? 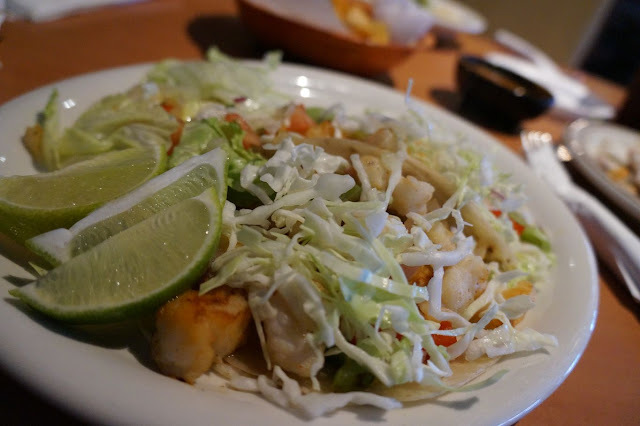 ), a collection of fish and shrimp tacos and the campechana tostada which is a mixed variety of seafood on a thick corn tortilla. Sounded rightfully enticing as we had heard about the quality and flavor of their fish for so long. Taco Giro has a ton of amazing stuff on their menu and if the food we got this afternoon was to be any good we will definitely be back to try some of their other options. They have a full breakfast menu, both Mexican and American, that includes a T-Bone steak, three eggs, huge helping of hash browns and toast for $14.99 or chiliquitas or huevos rancheros for $6.99 if a steak and some eggs for almost fifteen bucks doesn't sound tempting or financially feasible in the morning. 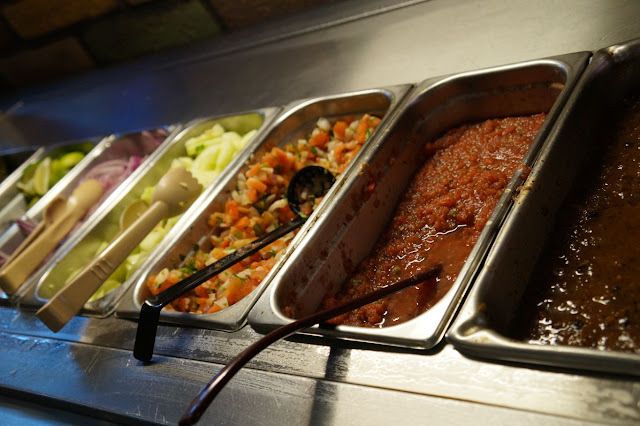 There are a bunch of lunch specials such as tostadas de ceviche de pescado and caldo de pollo starting at $5.99 and dinner specials ranging from $8.99 that includes pechuga de pollo, a carne asada plate and a grilled mojarra platter. All of it looks really, really tasty. 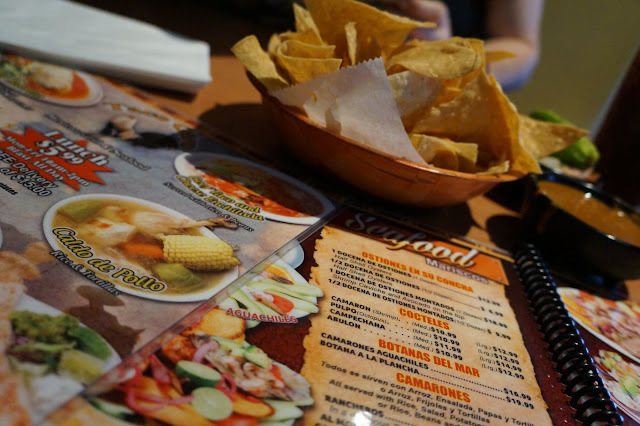 Things can get a bit on the pricier side of things, such as their fajita dinner and anything with a steak or ton of seafood attached to it (think $15 - $20) but the combination plates are in the $7 - $10 area and are really generous and really good. Oh, look, our food arrived! 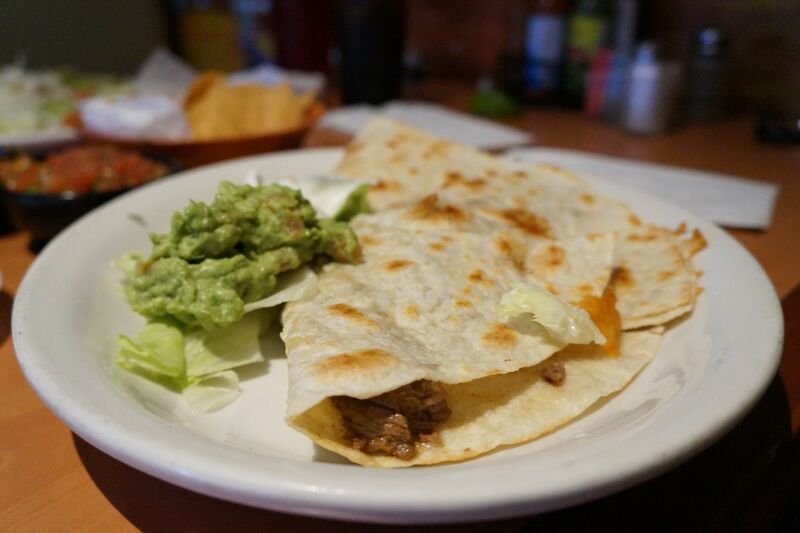 We first dug into the steak quesadilla and, yeah...it was awesome. Juicy, perfectly grilled marinated steak in a huge handmade tortilla with just enough cheese to satiate our "American" palates on the traditional dish. Fresh guacamole came with it too, like a mound of the stuff. Tangy, rich and seasoned perfectly. Yum. The fish tacos did not disappoint. Flaky grilled white fish under a sea (yes, we said sea) of crispy slaw and zesty crema. The shrimp was meaty and moist without a hint of fishiness, which is always impressive. Paired with the variety of hot sauces you get on your table, this was a serious lunch win on all fronts. The jewel in the crown of our royally awesome food was the mixed seafood tostada. 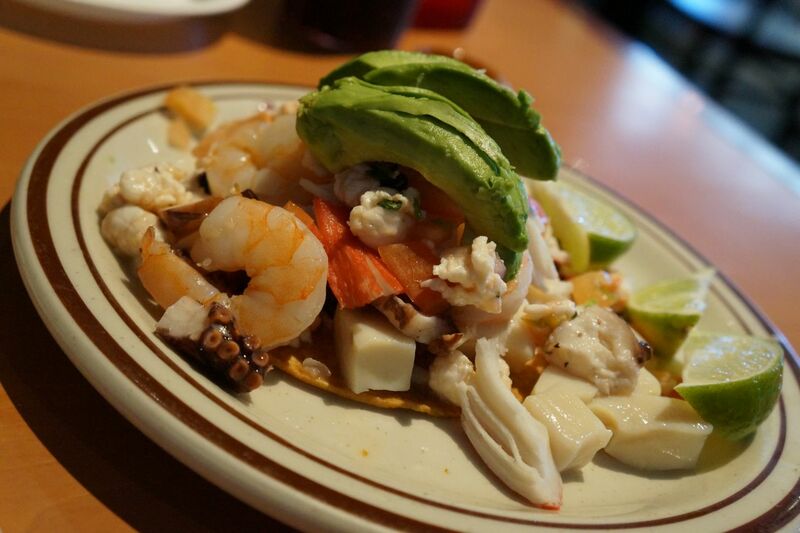 There was octopus, more shrimp, crab, more whitefish paired with citrus, cilantro, onion, tomatoes and then topped with market fresh avocado slices. Oh man, this sent us into an ocean of textures and flavors. Everything was so clean, so well seasoned and so composed we were stunned that it wasn't one of the more expensive items on the menu. So good. Okay, okay...we get it. 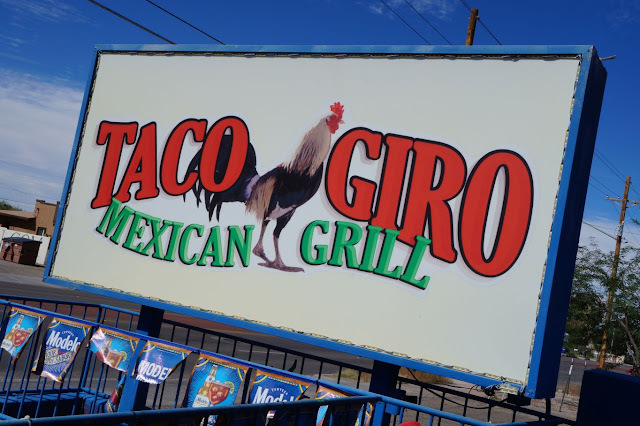 We are now fans of Taco Giro (which basically means 'taco turn' and features a chicken on their marquee...um, sure) and will be back to try out some of their other offerings. Twenty bucks or not, we are in too deep with the TG and now we have to seek out the other locations. But we still have so much left to explore in the Barrio Hollywood neighborhood. 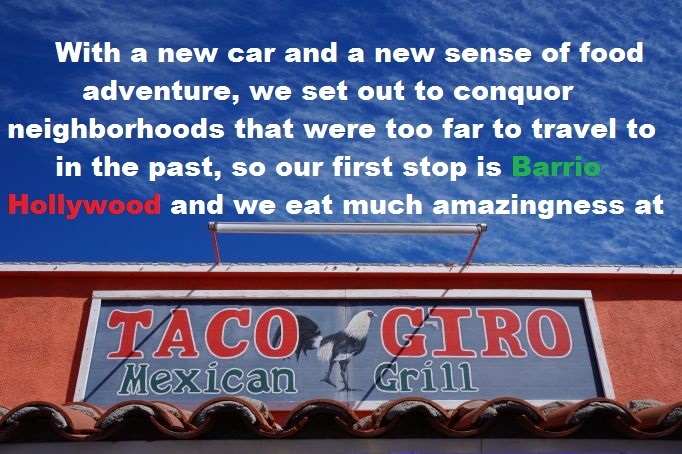 Taco Giro is only the beginning. And it is surely not the end. With a new ride and a new sense of Homeskillet pride, we press on.